The paper cutter also known as a guillotine or trimmer is one of the few office tools that are still manually operated. It’s used to cut large sheets of paper once and in a straight line. They’re used in a variety of environments including schools, offices, businesses and even at home. Common uses include trimming printed paper, scrapbooking and cutting photographs for framing. If you’re looking for the best paper cutter, here are four of the leading products online. Fitted with a 12-inch cutting blade, the ClassicCut Lite from Swingline is a good choice for home or office use. Its body is made from quality lightweight plastic making it easy to carry and resistant to rust. If you’re trimming many papers at once, the ClassicCut Lite can handle 10 sheets of paper at a time. It’s easy to line up your paper before trimming thanks to the printed on alignment grid and dual scale ruler. You won’t have to trim more than once to get the perfect cut. Concerns about accidental nips by the sharp blade have been solved through a protective guard rail and latch hook which keeps the blade secured when not in use. Being a portable trimmer, you’ll need to hold it down especially when trimming batches of paper at once. If you’re conscious about using eco-friendly products, the Fiskars Recycled 12 inch bypass trimmer is a good option. Its body is made from 100% recycled resin. This paper guillotine is made to last a lifetime with self-sharpening blades. Its blade will cut papers in batches of up to 10, and lengths up to 12 inches. 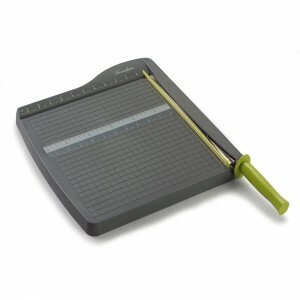 The base has a precision printed scale and grid, allowing you to make accurate alignment before cutting. A built-in paper clamp keeps your papers from shifting while you’re cutting. The base has rubber feet which prevent it from moving when in use. The cutting handle can be locked in place so you don’t have to worry about accidental cuts. While it’s one of the best paper cutters, the Fiskars Recycled 12 inch bypass trimmer is a bit heavy making transportation difficult. 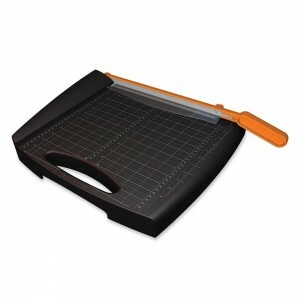 If you’re a scrapbooking enthusiast looking for a paper trimmer, the Fiskars 12 inch rotary trimmer makes a good choice. It’s fitted with a 28mm rotary blade that provides clean cuts. This cutter has a unique design which includes a self-leveling swing out arm. 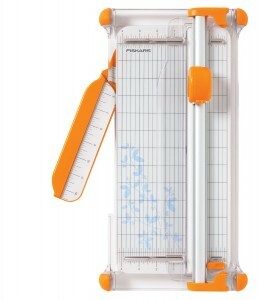 This extends the trimmer to 12.5 inches to handle larger scrapbook pages. Its base has an attractive mat upon which the measuring grid and scale are printed. To ensure that your photos come out perfectly, this trimmer has a smudge guard that’s built upon its expanding cutting rail. Although a good trimmer for scrapbooking and cutting photos, its rotary blade cannot handle large batches of paper at once. If you need a versatile and highly portable paper trimmer, the JLS 12 inch titanium scrapbooking paper trimmer is an excellent option. It weighs 12.8 ounces and designed for a variety of cutting tasks. This unique paper cutter can cut at 45-degree, and 90-degree angles. This is made possible by the swing out dual scale ruler and alignment grid that’s printed on its base. To ensure that you won’t nip your fingers, this trimmer has a built-in protective rail guard. This is complemented by a latch hook which keeps the blade secured when not in use. Operating lightweight trimmers might be difficult. The JLS titanium paper trimmer includes a paper clamp which makes operating it easy. It’s also capable of trimming batches of up to 5 sheets of paper. It’s worth noting that the titanium cutting blade for this trimmer is sold separately. Best Paper Cutter Buying Guide – How to find the right model for you. Before you invest in a new paper cutter, the following are the main factors to consider. 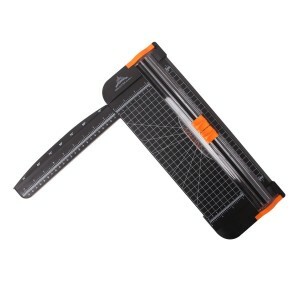 Many of the paper trimmers for home and office use are designed to be highly portable. This allows you to carry your trimmer to your working area easily. The best paper trimmers come fitted with titanium blades. These won’t wear down easily. If you can find one with self-sharpening blades, go for it. The base design will determine how easy it will be to operate the trimmer. A permanently printed on grid and ruler are the basic features. Other features mounted on the base to consider include a paper clamp and protective rail. Paper trimmer blades are extremely sharp. A simple mistake can cause serious injury. You should therefore, consider features such as a protective rail and a blade locking system which keeps the blade unexposed when the guillotine is not in use. The advantage of using a paper trimmer is that you can accurately cut a straight line along batches of paper. This however, doesn’t guarantee that the trimmer you buy will cut more than one sheet of paper at a time. Make sure to confirm the trimmer’s capacity before purchasing.